May 23, 2016 — #44 - Legislative hot topics and discussions with Michigan State Senator Jim Stamas. April 22, 2016 — #43 - Highlighting tours and partnerships with Bopp-Busch Manufacturing Company and the Bay-Arenac Career Center to accentuate the realized power of local and regional collaboration with organizations focused on the mission of excellence throughout the greater Au Gres area and the positive impacts on the quality of life for Au Gres residents. April 14, 2016 — #42 - Extending dynamic education, business, and municipal partnerships for sustainable growth and progressive leadership in STEM instruction and place-based education for Au Gres-Sims students and the vibrancy of the greater Au Gres area. March 18, 2016 — #41 - Michigan State Representative Joel Johnson (House of Representatives District 97) joins John and Jeff to discuss relevant topics throughout the greater Au Gres area. March 2, 2016 — #40 - Technology solutions for education, business, and municipalities. Representatives from SPI, Bill Loiacano (President and CEO) and Alan Daron (Director of Education Sales), join Jeff and John today to discuss integrated technology solutions and designs for both organizations and entrepreneurs. February 25, 2016 — #39 - Michigan State University Extension Partnerships. MSU Extension representative Tom Long, employed in dual roles as an Educator for the Career Education and Workforce Placement Team and the Capacity Building Team in Arenac County, discusses an array of resources and services provided in District 4 through the MSU Extension. February 18, 2016 — #38 - Early Childhood and STEM educational programming. Rich VanTol, Great Start Collaborative Coordinator at the Bay-Arenac Intermediate School District, joins Jeff and John for a discussion highlighting advocacy of early childhood education and STEM instructional practices to build supportive community cultures predicated on lifelong student success. February 3, 2016 — #37 - Jeff and John share their opinions about the Flint water crisis and the impacts yet to be realized on the greater Au Gres area, the region, and the State of Michigan. January 27, 2016 — #36 - Special guest, and "Wertz Warrior," Brian Knoll joins Jeff and John to discuss the upcoming 2nd annual Au Gres Polar Splash, highlight the charitable organization of the Wertz Warriors, and showcase the winter wonderland that Au Gres becomes each year. January 22, 2016 — #35 - An International Academy at Au Gres-Sims? 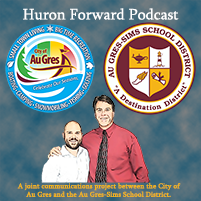 Jeff and John discuss several options embedded within a potential idea to create such an educational enhancement for the greater Au Gres area. January 13, 2016 — #34 - Special guest Dale Wiltse, City of Au Gres Park Manager, joins Jeff and John to discuss the encompassing leadership efforts of the City of Au Gres to provide an incredible city park, first-class facilities, and dynamic camping experiences for residents, campers, and eco-tourists. January 6, 2016 — #33 - Special guest Tim Barnum, News Editor for The Arenac County Independent newspaper, joins Jeff and John to discuss the partnered role of the "Independent" in continuing to help pave the vibrant, positive trend forward for the Greater Au Gres area. December 16, 2015 — #32 - Special guest Dr. Adam Hartley joins Jeff and John to discuss the concept of "Growth-mindsets" while championing ideas to foster leadership opportunities and engagement throughout the community. December 9, 2015 — #31 - "J & J" host special guest Tom Nixon, a local entrepreneur and Au Gres-Sims alumnus, to discuss successful business and entrepreneurial opportunities within the Au Gres area. December 2, 2015 — #30 - "J & J" host special guests, Mark Breederland and Brandon Schroeder, from Michigan State University Extension to discuss dynamic, special projects and partnerships throughout Au Gres. November 25, 2015 — #29 - A dynamic discussion about the recent 2015 Bridge to China Delegation trip and the positive impact on Au Gres. November 18, 2015 — #28 - Special hosts take the reins of the "J & J" show this week and discuss life in Au Gres. November 4, 2015 — #27 - A lively discussion focused on collaborative community events and the vitality of the Au Gres area. October 28, 2015 — #26 - A relevant and timely discussion about the importance and impact Detroit has on Michigan.